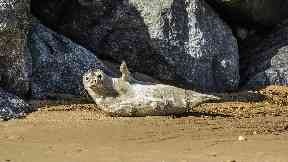 Scottish Sea Farms culled 11 seals under licence over the past year to protect salmon stocks. Seal culls at a fish farm company's salmon farms around Scotland's west coast and islands have fallen by a third in a year. Scottish Sea Farms culled 11 seals under licence to protect salmon stocks between February 1, 2018 and January 31, 2019. At the company's seven farms in Orkney, where the new protective nets were first trialled in 2016 before being rolled-out, there have been no seal culls in almost three years. The firm said seal culling is the "last resort option taken by farmers to protect the salmon in their care and is carried out under licence only when seals persist beyond all other preventative measures currently being invested in". Scottish Sea Farms' head of fish health, Ralph Bickerdike, said: "Our priority has been to install Seal Pro nets at those farms with a historic seal challenge. "The speed with which we can do this however, is dictated in large part by nature as there are limited opportunities in the growing cycle where we can install the new nets without risking stress to our salmon. "On occasion, we have installed Seal Pro netting at one farm only to see seals relocate to another farm where there had been no prior seal challenge. "This, we believe, accounted for five of the 11 seals culled in the last reporting period and is further reason why we will continue to roll-out the new netting until each and every farm is protected." The netting has been installed at 21 farms costing more than £4.2m and a further nine farms are due to be equipped in 2019 and 2020.